Fits RC4WD Universal Winch Mounting Plates (Z-S1609). This allows for you to get the winch mounted in just the right spot to prevent it from hitting other items on your build. The side gear lock is only for looks and is not to be used for the operation of the winch. Be sure that its not in contact with the gear or it can cause damage to your winch. Amazing detail and superior pulling power all in one package. Installed on Gelande 2 Cruiser for a match made in heaven. Winch will take 3s power all day long, but be quick on the controller cause you might snap line. This thing is a beast! I've installed it on my YJ. It's a heavy little rig and even on 2s it can drag it over grippy surfaces no problem at all! The detailing is spot on and the free spool feature is a nice bonus. A top notch product! 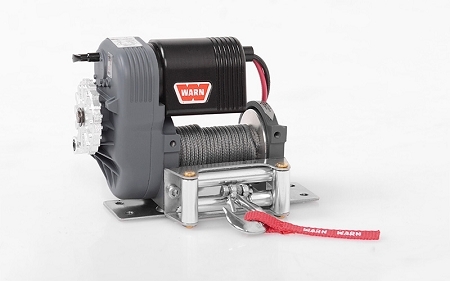 This is the scalest winch on the market! Details are amazing! Made from aluminum and cast metal, it has LINE BREAKING STRENGTH! I'll be putting this one on a few other rigs. Build quality is very nice, details superb and the free spool works great. However, mounting it on the Warn bumper (Z-S1590) seems to be quite a challenge. It says in the description to remove the fair lead, which is easy enough, the fair lead doesn't fit on the bumper, so you need a new one for that. Mounting the winch in the bumper is easy, but then you can't use the body since the winch is too far back, flipping the winch plate doesn't work. I think the center offset universal plate should work. I give it a 4 star rating since it just doesn't fit without ordering even more parts. Something that shouldn't be needed for a winch in this price range. I have used a lot of winches over the years and side more with servo winches for what I do. But I took a chance on this winch for my 1/6 build and it works great.